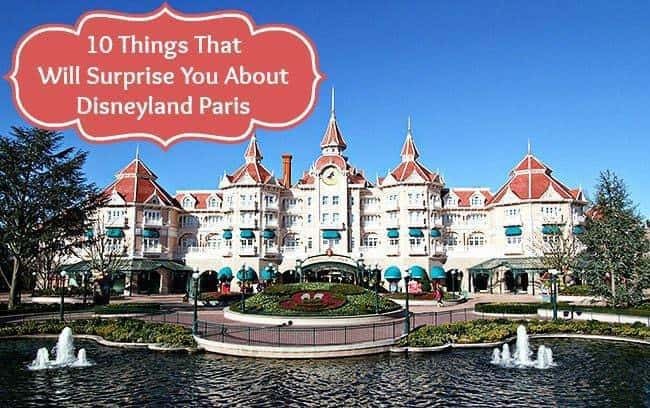 I am most certainly going to write more about our trip to Paris and the two days we spent at Disneyland Paris, but I wanted to start out with a small post about the things that surprised me the most about the park. There were some doozys! 1. Smoking is allowed everywhere. For those of us who are used to the American Disney parks, this is a huge shock to the system. We truly aren’t used to smokers everywhere anymore and that’s not just theme parks. We were standing in the crowds early one morning waiting for the park to officially open and were treated to billowing clouds of cigarette smoke from people around us. Not only that, people smoke while you are walking in the large crowds to get places, so I found myself literally having to dodge to the side to avoid my coat (or myself!) from being burned with cigarettes from people who were walking in these jostling crowds with their smokes hanging by their sides! It was crazy! And really, really gross. While they aren’t allowed to smoke in the actual line ups, it didn’t make a difference. Blech. 2. The food isn’t that good. I’ll be expanding further on this, but the food there is a shock to the system. I have written reviews about the places we actually enjoy eating in Disneyland, Anaheim, so we have found good food in Disney, but not so much here. And in Paris, of all places! I list this as a surprise because believe it or not, there is good food to be found in Disney Parks in North America. 3.The princess dresses are amazing. I had to hold myself back when shopping and only buy my daughter two dresses (ok fine, and a cape) from the stores in Disneyland. The dresses are AMAZING. They have longer, thicker sleeves (most likely because Paris is chillier than Anaheim), have hoops that bell out the bottom of the dress (SO CUTE) and are better made. I can’t rave enough about them. Not only that, I found her a warm, hooded cape to wear with her Aurora dress, something I have never seen in the States. I could have bought one of each dress! Most likely because of where it was built, the park seems very sprawled out all over. Not only that, there are tons of trees and green space, more than any of the other parks. 5. You have no problem if you don’t speak a lick of French. Disney has you covered, of course. The staff is mainly bi-lingual, enough to help out any English tourists and if you are familiar with the other parks, you know the drill by heart! 6. It can get so very cold. Brrrr. Rare is the day in either North American park that you have to don a toque and mitts, but in Paris in the winter months? Oh, yes indeed! We were bundled right up and it’s the coldest I have ever been in a Disneyland. It’s a very weird feeling, for those of us who are used to jeans and a hoodie at the worst in Disneyland. 7) The merchandise is suited to colder weather and thus awesomer for Canadians. I loved that there were Disney themed heavy jackets, toques and more available to buy in the stores, because that’s my kinda gear! We were amazed at how the merchandise was so different from the North American stores. 8. Off season is seriously off-season. It’s cold but it’s quiet! It was surreal walking through a Disney park and not even seeing a person in some places! Some areas were literally like a ghost town and the lineups were only long at the most popular rides. With that said, the drawback is that certain restaurants are closed during the off-season, something which never happens in North American parks, everything is open all the time. So it was weird to go and have restaurants closed, some areas closed and a very quiet park. 9. The rides are the same, but different. That was the most fun, seeing how the rides differed from the North American ones. The Haunted House turns into the Phantom Manor and has similarities, but wasn’t exactly the same. Peter Pan’s flight was the same, but smartly had a Fast Pass option. It was awesome exploring all the rides. 10. You only need two days there. You really don’t need more even though there are two parks, they are smaller than their North American versions and in the quiet season take much less time to go through. Two full days was enough for us, I can’t see that we would ever do more than that. Seeing how we do five in Disneyland Anaheim, this was a shocker to us as well. Has anyone else gone to Disneyland Paris and has more to add? Anything that you found surprising as well, being used to the North American versions? It was a fun two days and I will be writing up more posts about each part, those are coming soon! @blabla Staff were letting people smoke right in front of them, so if you don’t enforce a feeble rule, then it;’s allowed, in my opinion. There was (and still is) smokers everywhere. We just went back this June and spent another three days there and people are still smoking everywhere you look. @Timeless Disney Good to know the difference! It’s really gross though, I wish they would crack down on it! And I used to smoke, so I have a higher tolerance than most people! To update, we went again this year and it’s just as bad. We saw smokers puffing away right where staff could see them. To me, that’s permission by apathy. Not only that, it’s going downhill when it comes to standards. For fireworks there were people standing on benches, adults standing on the RAILINGS and climbing in trees, I kid you not. During parades they let you stand wherever you want. Blocking people trying to walk? No big deal, find somewhere else to walk. We were so disappointed. I don’t know if we would go back next time we are in Paris.